The AP/Guardian reports that the service, which was both solemn and emotional, began with a reading of the victims’ names. The service was also marked by the visible presence of police, who were checked bags outside of the church and stood throughout the sanctuary. 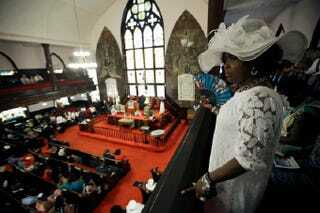 Regardless, the congregation remained welcoming.